President Moon and the North Korean leader Kim held their third meeting in Pyongyang. Moon arrived at the North capital on September 18 and talked with Kim for about 2 hours from 3:40 pm. Moon wrote the visitor's book "We are one mind for peace and prosperity! 18, 09, 2018, South Korean President Moon Jae-in". It was the first time that the headquarters of the Labor Party was opened to the South Korean media and the two leaders walked the stairs to the meeting room on the second floor. "I've met Moon three times and I feel like we have become really closed each other. There have been significant progresses in many areas since we first met and I think it was all because of Moon's hard work" said Kim. "I think we both are feeling a burden on our shoulders as well as grave responsibility. I hope third meeting will leave the 80 million Koreans an abundant autumn harvest on this Korean Thanksgiving holiday. The world is watching us and we should answer them with the fruit of peace and prosperity." 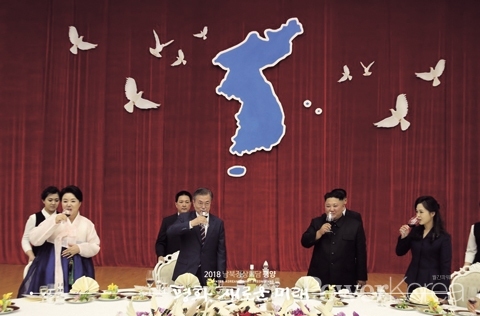 At the dinner party, Moon said "A complete denuclearization and settlement of peace in the Korean Peninsula is our important task and I will continue drawing a big picture for peace and prosperity. It is just the beginning. We can make a future that no one has ever dreamed of. Working together will cross the continents to Russia and Europe and the seas to ASEAN and India. For this, I and Kim will gather our hearts and heads together. We will achieve advancements in military, economy, society and culture and bring up the measures to remove the horrors of war." Kim in respond said "I feel certain that the meetings with Moon will accelerate the North-South relations and will write a new history for the whole Korean people. We will give details on implementation measures of the Panmunjom Declaration this time and I believe the trust Moon has built and showed us will speed up our steps to peace and prosperity." President Moon and North Korean leader Kim held up their hands together at the Changgun peak of the Paektu Mountain, the soul and spirit of the Korean people. Paektu Mountain is the highest mountain in the Korean Peninsula and the Baekdudaegan - Beakdu ridges: the spine of the Korean land - starts here to curve down to the Jiri Mountain and the further south. "The Baektusan has all four seasons" introduced Kim to Moon by pointing out from left to right. "I feel we have to write a new history by the spirit of this water and for reserving the water as long as it lasts." Moon said "Today, I have fulfilled my dream of climbing the Baektusan through 'our land'. And I feel really touched. I once told you at the April 27th meeting that Koreans are reaching the Baektusan through the Chinese side but I sealed my will firmly that I only reach the mountain through 'our land' though I had a feeling that it would never happen. But like you see today, it is fulfilled." Kim responded "The Baektusan have been the mountain of longing for the people in the South as they could only watch the direction. I hope they and the Koreans overseas come to see the mountain in the future." Moon then said "We have taken the very first step. If we repeat this, more people will try and the ordinary people in the South also can visit as tourists one day." Climbing the mountain was suggested by Kim on Moon's arrival at Pyongyang and Moon agreed. As the fruit of the third meeting, Moon and Kim announced the Pyongyang Declaration on September 19. The declaration can be summarized as following: the North and South share the need for turning the Korean Peninsula as a land of peace without the threat of nuclear weapons and for this, push forward substantial implementations that will lead to declaring the end of war and to peace and prosperity.